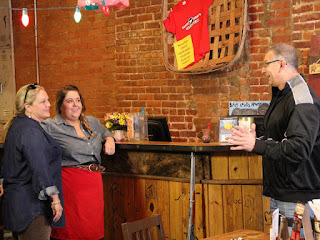 Chef Robert Irvine visits Nanny Goats Cafe and Feed Bin in Kilgore, Texas, where he finds a owner Nancy Dupre, who flips restaurants for a living but is struggling with this restaurant. The cluttered decor and inconsistent pricing on the menu are big problems in the restaurant. The food is the biggest issue and Nancy threatens to walk away from the process after it is discovered that the root of the restaurants problem is her daughter, Jess, who cooks in the kitchen but isn't qualified or experienced in running a kitchen. Nancy sold the business just weeks after the show was filmed so that she could retired, Jessica also left but the other staff remained in place. The new owners reported that business is good and the restaurant is full most days. They planned to offer a dinner service over the coming months. This location closed in November 2013, the Longview location remains open. This episode was episode 8 of season 5 and was aired on February 20 2013, there were 13 episodes in the season, airing between November 2012 to March 2013 and the season 5 closure rate currently stands at 93%.